I was only a high school senior when I first arrived at the therapeutic riding center Equi-librium 3 years ago. I felt lost; I didn’t know what I was doing with my life or what I truly wanted.. I was hurting, but I wasn’t ready to acknowledge my pain. I wasn’t ready to accept myself; I was trying to be everything but my true self. The truth was right in front of me, but I couldn’t see it. Or rather, I didn’t want to see. When I mounted the horse during my lesson, though, I knew that my pain would only hold me back. If I truly wanted to become a better rider, I would need to work through everything that internally stood in my way. I had to turn the pain and fear inside myself into power and persistence. Anyone who rides horses will tell you that riding is all about feeling. It’s about finding your balance. It’s about being aware of the horse’s body and feeling their movement underneath you. Riding taught me how to connect with myself in ways I never dreamed possible. I can’t say that you have to feel to ride, nor can I say that I completely understand how to feel connected. For me, not being able to feel provided the motivation to master riding. As I’ve walked, cantered, and trotted, and halted, I’ve worked to show the world that “different” doesn’t mean “less.” Riding has helped me live, love, and grow. It’s pushed me to be the best version of myself, but most importantly, to be myself. So I stopped trying to pretend that I could feel, and began accepting who I really was and where I was in life. I learned how to set my baggage down and let it go. When I stopped trying so hard to hide my true self, everything became easier. I was no longer walking on eggshells, trying to hide myself. The darkness inside me no longer stopped me from finding my own light. Somewhere inside my hurting body, I knew there was something better… something stronger, something real. That drive gives me the fire to keep going, to never stop. Even on my weakest days, I choose perseverance. 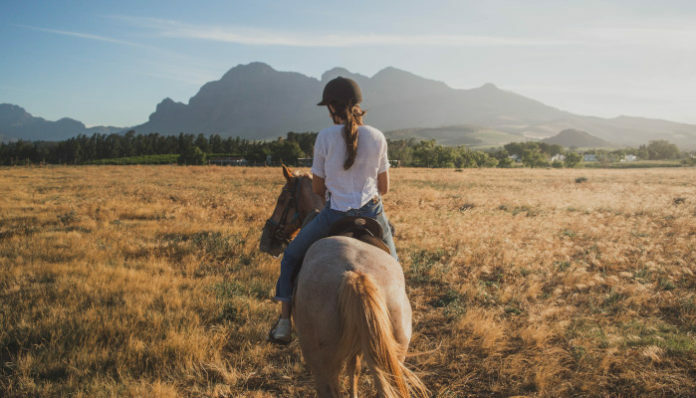 That burning desire to find myself kept me going on the days when I questioned everything or felt frustrated that I couldn’t connect with my horse. All I needed to do was remember how far I’d already come, then keep going. I just needed to remember what I was really fighting for: myself. 6 months ago, I started cantering again. I was weak, I struggled, but I refused to stop. I knew that if I wanted to keep growing, I needed to summon my strength. So I started working with a personal trainer, and now, I’m at the gym 6 days a week. I’ve set new goals, and I’m ready to reach them. My new goal? Learn how to jump, and start competing in horse shows. The biggest thing I’ve learned is that riding can only teach you what you choose to let it. I’ve learned to persevere. I’ve learned that if you want something badly enough, you will use your will, determination, and courage to do whatever it takes to reach your goals. Riding has taught me that when you stop overthinking, you realize life is only hard because you’ve made it that way. It’s taught me to never forget what you’re meant to accomplish. Riding has taught me that you have to be brave enough to try, to fail, to fall, and to get back up again. You grow when you choose to keep going. That’s where you discover your full potential and grab onto it. Those moments when you hit rock bottom teach you to rise. It all starts with being true: true to yourself, true to your situation (no matter how ugly), and true to those around you. Riding taught me to be true, and that is the most freeing feeling in the world.